The oil boom continues into this new year of 2013 with the Eagle Ford Shale area of Texas continuing to see growth in the drilling expansion of areas in this geographic region. It was recently reported by oil and gas Wood Mackenzie analyst Callan McMahon that the Eagle Ford play will be the largest in the world due to capital spending in this area. The result of that analysis means that the South Texas oil play will be invested in more then any other single oil and gas development in the world. That is exciting news for the Lone Star state and the companies that service these projects. It was stated that in terms of overall investment, from 2012 to 2015 expected capital expenditure in the Eagle Ford will surpass the projected capex of the entire Kashagan Offshore Oilfield project in Kazakhastan. This project represents the largest standalone energy project in the world. 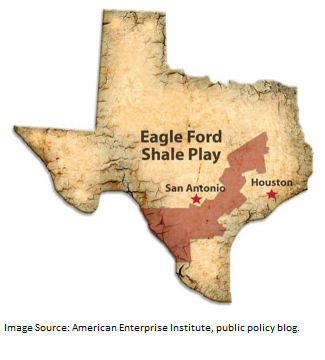 We expanded on the history of the Eagle Ford Shale play in a newsletter article last year. This area of oil and gas is over forty miles wide and four hundred miles long, spanning an area from near Mexico to East Texas. Fracking or hydraulic fracturing in this area took an economically unviable area to the most actively drilled targets for oil and gas in the United States. The result of this investment will provide continued economic growth and health pumped into the Texas economy. With this rapid growth, the need for expanded workforce, workforce housing solutions, and necessities to support the growing communities in this large geographic area is dramatically increasing. We will be expanding on this growth and its effect on the overall infrastructure to support this development in the months ahead. Falcon Containers continues to support the workforce housing solutions in the oil and gas industry through the development of our Oil Field Village design which is a mobile multi-building design using our repurposed shipping containers for the development of a man camp village solution. For more information and specific case study examples, please refer to our Multi-Container Project area of our website.